In July and August BigLift’s mv Happy Star transported 31 transition pieces (TPs) for global maritime contractor Van Oord. 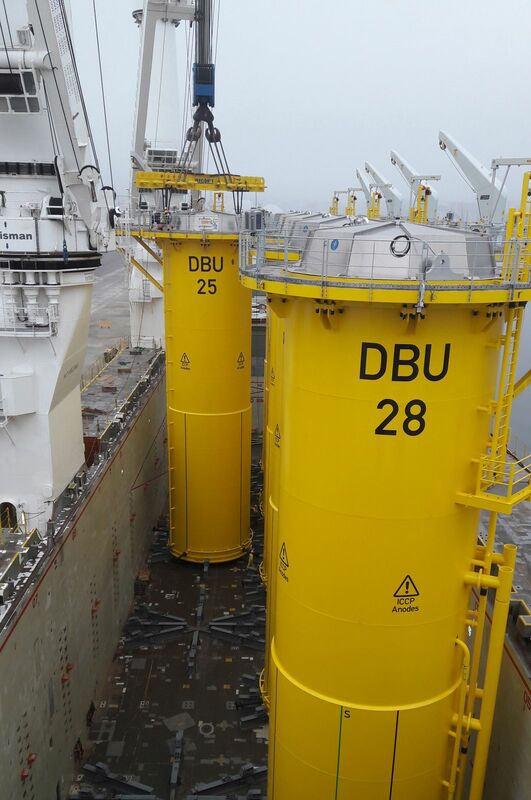 Destined for the Deutsche Bucht (DeBu) Offshore Wind Farm, the TPs were loaded in Avilés, Spain, where they had been manufactured, and were discharged in the port of Cuxhaven in Germany. Weighing 335 mt each, the transition pieces stand at 29 metres high and have a diameter of approximately 6.8 metres. Every TP was shipped fully equipped with anodes, platforms, ladders, maintenance crane and internal equipment already installed. Happy Star made three trips from Avilés to Cuxhaven where the TPs will be loaded onto an installation vessel to be taken to the offshore site, which is 95 kilometres northwest of the German island of Borkum. The first 11 arrived in Cuxhaven in mid-July and the final voyage saw the 31st TP unloaded in mid-August. For a heavy lift shipowner such as BigLift, transition pieces are not the most complicated of shipments. However, moving 11 TPs in one shipment made this unique. To be able to do so safely and reliably required the use of every square centimetre of Happy Star’s hold. Preparations for the project started about three months in advance, time needed to engineer lifting, stowage and seafastening. Extensive lifting simulations were performed to ensure that all the TPs could be loaded and discharged in the required location in Cuxhaven. The outreach and positioning of the TPs was carefully checked to avoid any clashes. The TPs were both loaded and discharged in double rows and some had to be delivered on the quay almost 23 metres away from the ship’s side. This made for some challenging lifting operations. The TPs were kept in place by a purpose-built grillage, which was designed to be reusable and to be efficient to install. A FEM analysis was run to determine the interface between the grillage and TP and between the grillage and ship’s deck. The grillage was designed by BigLift in close cooperation with Van Oord. During the operation it became clear that the time required for securing each tower fell within the time calculated for loading, which made for a very efficient operation. This way, up to seven TPs could be loaded per day. Loading or discharging such pieces is a precision act in itself. A complicating factor was the exposed berth in Cuxhaven, where swell can cause movement of the vessel and additionally, the busy river traffic had to be constantly monitored to limit the waves of passing vessels. Sometimes, lifting had to be stopped with the cargo in a safe position to let vessels pass by and to ensure that the vessel’s movements did not cause any damage. By maintaining a vigilant lookout and with good communication between the shore, vessel and the Elbe River Traffic Management Centre, we could ensure that all TPs were placed in their required position without any damage. Deutsche Bucht Offshore Wind Farm is Northland Power’s third offshore wind farm. In 2017 Van Oord was awarded the Balance of Plant contract. The scope consists of the design engineering, procurement, construction and installation of the foundations, inter-array cables and offshore substation, and the transport of the wind turbines. The wind farm will comprise 33 MHI Vestas V164-8.0MW turbines – 31 on monopiles and two on mono bucket foundations – and will have a grid capacity of almost 269 MW. This means the wind farm will supply enough renewable energy to meet the needs of approximately 328,000 households each year. The first foundation at the Deutsche Bucht Offshore Wind Farm was installed last September in a water depth of approximately 40 metres and consists of a monopile fitted with a transition piece. Commissioning is expected to take place in the second half of 2019.